Oh for just a bit of the civic pride that built bandstands, and a wee bit of the sense of community that put on regular band concerts within them. The Clapham Common bandstand for example, built in 1889 after the locals petitioned the London County Council. It cost £600 to erect and, twice a week – Wednesday afternoons and Sundays – one could stroll over to the common and hear a concert, presumably for free. The bandstand was, apparently, used as a rock mini-venue at times in the 70s and into the 80s, including an early concert (September 1977) for erstwhile stadium-rockers Dire Straits. But it was not treated well in the latter part of the last century, and by 2003 was deemed unsafe. Credit where it’s due, Lambeth Council did put £200,000 towards its restoration, £100,000 came from the local community and a whopping £900,000 from the Heritage Lottery Fund – thank you Lotto players everywhere. 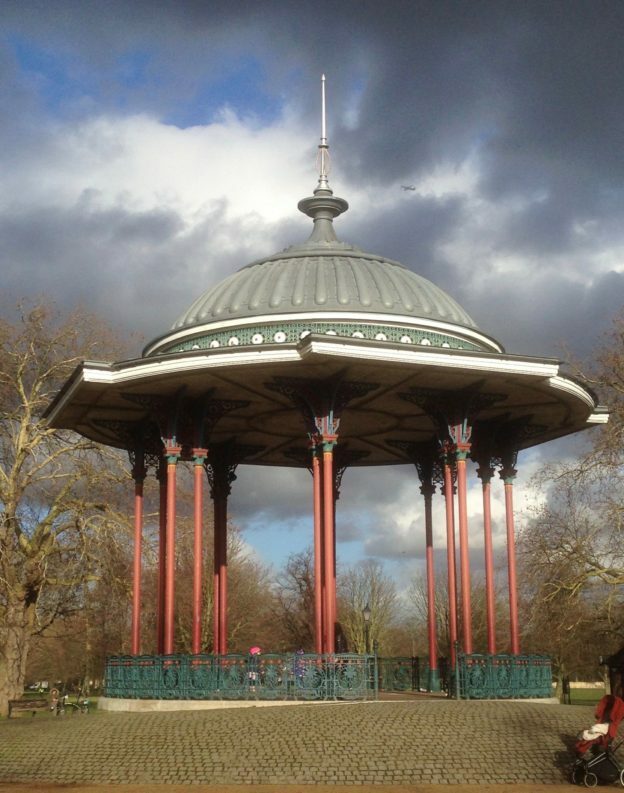 According to an information board on the Common, the structure is a copy of two other bandstands (dating from 1861) that were in the Royal Horticultural Society’s gardens in South Kensington, it is thus a great example of mid-Victorian civic architecture and, quite rightly, Grade II listed by English Heritage. This entry was posted in clapham common, The Blog and tagged clapham, clapham common on 26/01/2018 by donbrown.